1951 Bentley wedding car hire in London. The classic 1950's Bentley is a unique to find available for wedding hire in London and will look amazing in your wedding day photos. 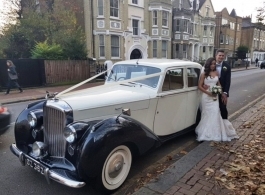 The traditional Ivory White & Black colour of the car will compliment a White wedding dress beautifully and the overall shape and look of this classic car really does suit a London wedding.